Today I am going to tell you about Verizon’s Unlimited Wireless Plan. This is a post-paid wireless that Verizon recently added in 2017. Starting in 2016 with T-Mobile, unlimited wireless plans have become popular again and the big four carriers AT&T, Verizon, T-Mobile and Sprint offer post-paid unlimited plans. With Verizon’s Unlimited Plan, you can get unlimited talk, text, and data on one line for $80 per month. Verizon offers multi-line discounts so two lines costs $140 per month or $70 per line. Three lines costs $160 per month or $54 per line. Four lines costs $180 per month or $45 per month. The savings continue our to 10 lines which cost $300 per month or $30 per month. None of these prices do not include taxes and fees. I normally cover prepaid but not post-paid wireless plans, but a reader, John, asked me if I could take a look at the plan and tell him what I think. I’m not going to sign up and do a full review, but I decided to take a look at verizonwireless.com and see. Now, John is currently using Straight Talk’s $55 Unlimited Plan that comes with 10GB of high speed data. He uses a lot of data and has been having problems with Straight Talk’s AT&T and Verizon networks. John’s plan is to sign up for Verizon Wireless Unlimited with three other family members so the cost would be $45 per line. He is currently paying more money, $55, for less data per month so this looks like a pretty attractive deal. 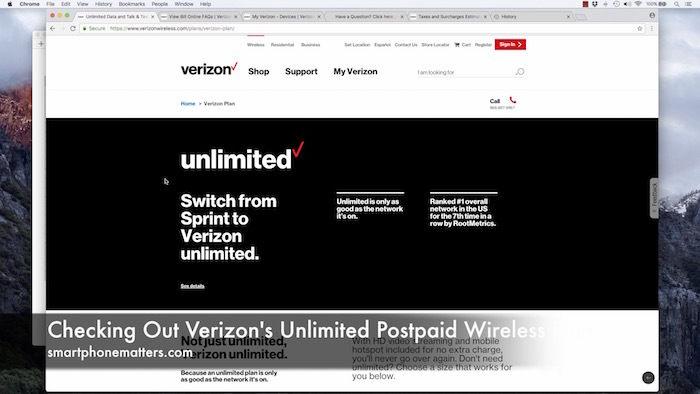 Looking on verizonwireless.com, you’ll see they describe the Unlimited plan at the bottom of the page. The plan includes unlimited data. But, after you use more than 22 GB of data per line per month, Verizon may prioritize your data behind other Verizon customers when the network is congested. They don’t provide details of what this really means though. Your data speeds could be reduced or you may find your data is less responsive. Also, if you are roaming domestically, your data speeds are limited to 2G. The plan also includes unlimited talk and text with calling to Mexico and Canada as well. The plan includes Mobile Hotspot and Device Tethering so you can connect your phone to your laptop, tablet, or other device and use your cellular data to get on the internet. After you use 10GB of data per month though, your hotspot speeds are reduced to 3G speeds. It doesn’t say whether this is 10GB is your total data usage or 10GB of hotspot usage though. The plan also includes service in Mexico and Canada. You’ll be able to use talk, text, and data is either Mexico and Canada. There are some restrictions though. You can use up to 500Mb of data per day, and after that your speeds will be reduced to 2G for the remainder of the day. If more that 50% of your usage in a 60 day period is from inside one of those countries, Verizon mat remove or limit your service. I suspect this is to keep people living in Mexico or Canada from signing up in the US and then returning home and using this service there all the time. The plan also includes HD video streaming. Other unlimited wireless services reduce streaming quality to SD, or DVD quality video, but Verizon is not. All in all, I am pretty impressed with the plan. I think the limitations are reasonable. And at if you are getting four lines, $45 per month is less than most single line prepaid wireless plans. Next though, we need to look at those taxes and fees to understand the actual cost per line. Since Verizon redesigned their site, I find it hard to find the details there. Using a Google search I found Verizon’s Tax and Surcharge Estimator. I used the estimator to determine the taxes and fees for Massachusetts where I live. According to the Estimator, I’d pay $21.63 in taxes and fees, based on a monthly cost of $180 for four lines. This includes $1.23 administrative charge, a $0.21 Regulatory Charge, a $7.94 Federal Universal Service Charge which is 4.41% of your bill. I’d also pay $11.25 in MA state sales tax (6.25%), and finally a $1.00 MA E911 Service Surcharge. This brings the total bill to $201.63 or about $50.41 per line. Note that these charges will be different in your state. Also I wonder if some of these fees are charged per line and not per account. The sales tax and Universal Service fee are percentages of the total bill but I wonder if the E911 and other charges may be applied per line. Now I still have more to say. If you sign up for a multi-line plan with a family, extended family, or friends you may want to consider who pays the bill and how they are reimbursed, what happens if someone doesn’t pay, and the overall privacy of your account. If you sign up for four lines, one person pays the bill and three others need to pay that person their share. You’ll have to thing about who will pay the bill and how the others will pay them each month. Will it be cash, check, electronic payment. The first two options may be inconvenient every month. Electronic payment usually has fees for the payee, so who will absorb that cost. You may also want to consider what happens if one person runs up additional costs or services on their bill. This could be something like international calls or use of directory services. It’s also possible that Verizon has other services that can be charged directly to your bill, the account owner will have to calculate each person’s bill each month. Also think about what happens if one or more people constantly pay late, or stop paying. The remaining people will have to decide to either carry them or drop them. If you drop lines, your costs per line will go up. Finally keep in mind that the account owner has access to the account history of all the lines on the plan and can see usage information such as incoming and outgoing call history. Alright, I think that is enough for now. What do you think? Are you using or going to switch to Verizon Wireless’ Unlimited plan, leave a reply below and share. —-If you’re BYOP, its the last 15 digits of the SIM card (ICCID). My advice is that if you want to port a number from straight talk, do it early on before the last days of your service because I was stuck for 2-3 days without data. Weirdly my phone appeared as inactive on my straight talk account, but I was still able to make outgoing calls. I went to my local Verizon store in Florence, SC this morning and they said my port finally pushed through moments before I walked in the store and Straight Talk had released my number, but by that time I wanted an entirely new number. I walked out with my unlimited data plan and am very satisfied. I haven’t done a full-bar speed test yet, but I’m getting about 40 Mbps down and about 10 Mbps up with 2 bars on my iPhone 6. I’m just glad that I do not have to deal with Straight Talk customer service ever again. I am glad to hear you are up and running. No one should have to deal with the issues you were having.